OK, so somebody somewhere has information that can lead to the arrest and conviction of the disgraceful, cowardly punk who shot and killed Victor Felix Jr. on June 1, 2016. To that person with the information: an award awaits you--up to $1,000. Details below. And you can remains anonymous and still collect the reward. 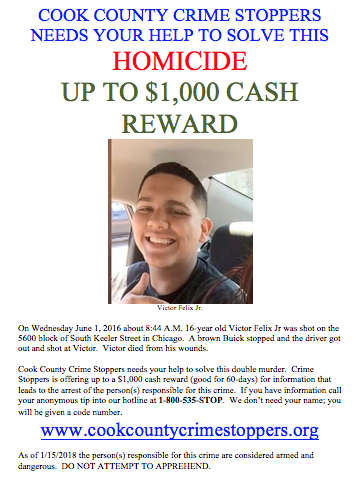 Cook County Crime Stoppers is a trusted organization that has been paying cash rewards and solving crimes for more than 30 years.